The LG G3 has on-screen navigation buttons in a traditional Android layout, but that doesn’t mean that LG still didn’t find a way to make things their own. 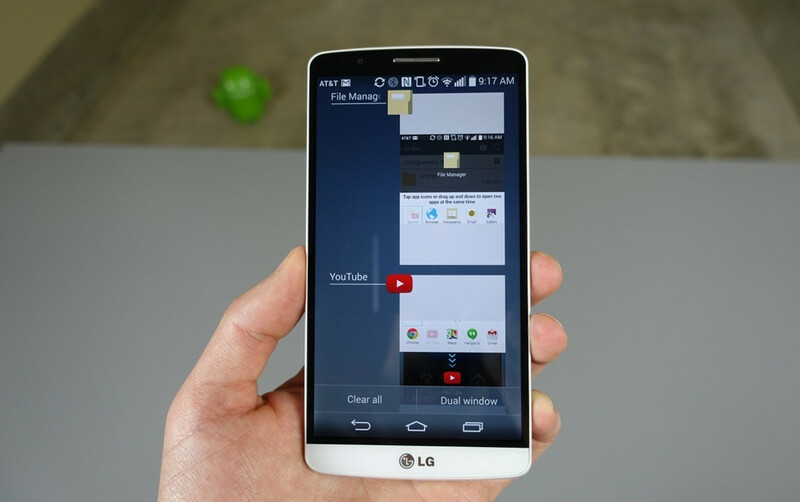 I’m talking about the app switcher, which LG customized in the most awkward of fashions. Fortunately for all, it can be adjusted in ways that make it much more useful. When tapped out of the box, the LG G3 app switcher displays up to nine recently used apps in a layout similar to what you would find on the HTC One (M8). These are full previews of the previously used apps laid out in a grid, though LG went ahead and put the most recently used one in the top left corner, which would be furthest away from your thumb should you be using your right hand. If you ask me, the most recently used app should always be at the bottom or in the bottom right corner, depending on the layout. Since nine apps is quite a lot, plus that top left corner can be difficult to reach with one hand, LG has given us a pinch-to-zoom action in the app switcher that allows the layout to be tweaked. If you pinch out (fingers separating), the app switcher will zoom in to a quad-box layout before ending with a single column, vertically scrollable list of apps. In other words, you have three possible layouts for app switching. Hopefully, one of them will get the job done. To see the customizable app switcher in action, check out the clip below.